The type of diet that your child eats will affect their mood. For example, there is increasing evidence that food additives are responsible for hyperactivity in children. Artificial food colourings, preservatives and other additives are becoming more and more implicated in excitable behaviour in youngsters. In one recent study, researchers found that removing food additives from the diet of a group of 3-year-olds caused a reduction in the hyperactive behaviour that had been reported by their parents. When the food colourings and preservatives were added back into the children’s diets, the parents reported an increase in hyperactivity. The study proved to be far from conclusive, but the researchers felt that if the findings were confirmed by further studies, the removal of food additives from children’s diets might help to reduce their long-term risk of behavioural problems. Which foods can make my youngster hyperactive? 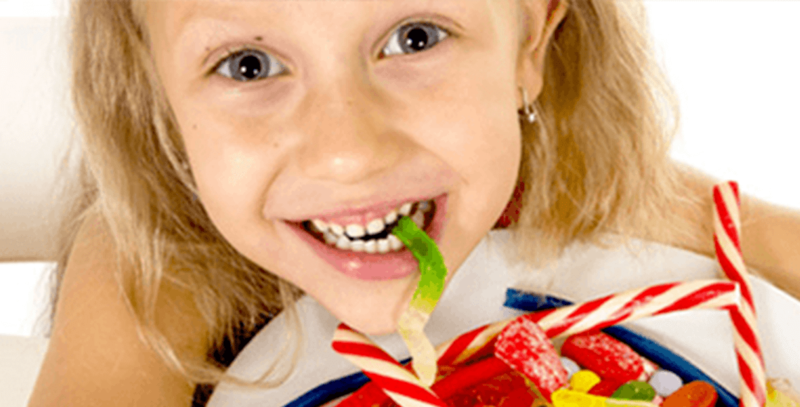 It’s not just additives that can make children behave in a hyperactive fashion. Foods that are high in sugar or refined carbohydrates, such as white rice and white flour products, have what’s known as a ‘high glycaemic index.’ The glycaemic index measures the effect of carbohydrates on blood sugar levels and those foods that are high on this list are more rapidly absorbed into the bloodstream. This can cause a quick rise and then decline in blood sugar levels. Foods with a low glycaemic index, including whole grains, are absorbed more slowly into the bloodstream and have a more gradual effect on blood sugar levels. When blood sugar levels have dropped after high glycaemic foods have been eaten, it triggers the release of counter ‘stress’ hormones like adrenaline and cortisol. These hormones can produce feelings of restlessness, anxiety and irritability. In children who are naturally energetic by nature, the result can mean outbursts of hyperactivity. Start an ‘elimination’ diet for your child to determine if food reactions are playing a role in their behaviour. Foods that commonly cause allergies, such as wheat, milk and dairy products have also been implicated in hyperactivity. By eliminating these products and sticking to foods that do not commonly cause allergic reactions, such as lamb, chicken, bananas, pears, rice, potatoes and vegetables, you can observe if hyperactivity decreases. After two weeks, you can start adding the omitted foods back into your child’s diet one-by-one and monitor for any allergic reactions or changes in behaviour. Cut down on high glycaemic foods, such as sugar, white bread and white rice. Instead, give whole grain alternatives that release energy more slowly and are less likely to cause the release of cortisol and adrenaline that can make your child irritable and fidgety. Cook as much as you can at home with fresh ingredients. It can be tough as a busy mum trying to find the time to cook meals at home – sometimes ready-made dishes are a welcome time saver. However, these types of meals contain many artificial additives as well as natural additives in unhealthy quantities, such as salt. Cooking with fresh ingredients at home means that you know exactly what is going into your child’s meals. Salads are quick to create as well as being healthy for your child. To balance a salad with other nutrients, cook batches of chicken drumsticks ahead of time and keep them in the fridge. Consider giving omega 3 oils to your child. There is some evidence that increasing the amount of omega 3 oils in your children’s diet can improve disruptive behaviour. Omega-3 fats are found in fish, walnuts and flaxseed. It is thought that a deficiency in these essential fatty acids might precipitate allergies and possibly hyperactive behaviour. So while the most important way of helping your over-active child is by improving the overall quality of their diet, you may also wish to give them a fish oil supplement.